Houston is using Smore newsletters to spread the word online. 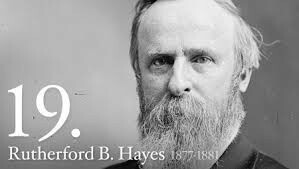 · Born in Ohio in 1822, Hayes was educated at Kenyon College and Harvard Law School. After five years of law practice in Lower Sandusky, he moved to Cincinnati, where he flourished as a young Whig lawyer. · Hayes pledged protection of the rights of Negroes in the South, Hayes insisted that his appointments must be made on merit, not political considerations. For his Cabinet he chose men of high caliber, but outraged many Republicans because one member was an ex-Confederate and another had bolted the party as a Liberal Republican in 1872.